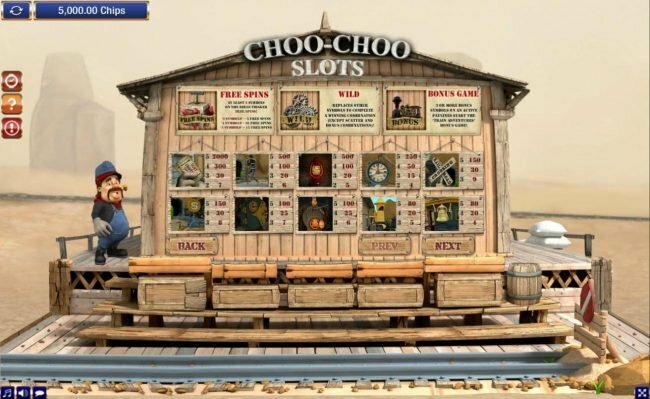 Choo Choo Slot Slots has not been reviewed yet, be the first to rate this slot. 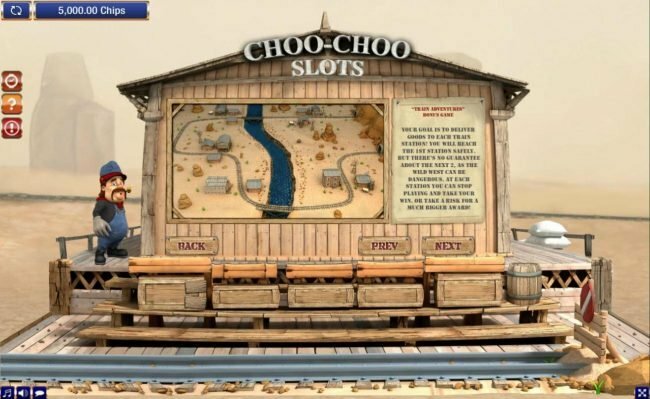 Choo Choo Slot is a 5 reel, 25 payline GameOS designed video slot that has players experience what it would be like to be a train conductor out in the desert. 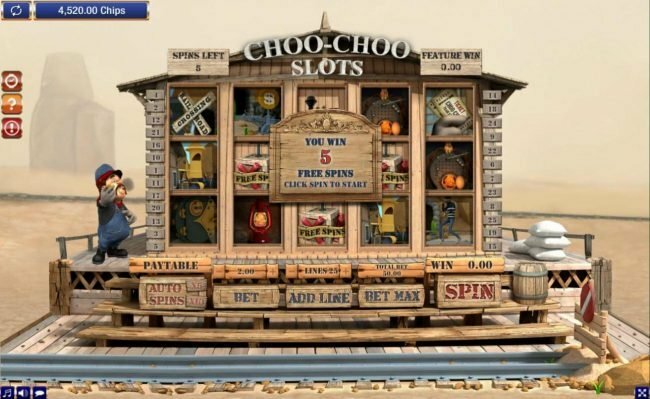 Free spins, bonus games, scatters and wilds are the available features to be won. There is also a cash prize of $4,000.00 waiting to be won. The illustrations of this game are truly some of the best seen on the web. Everything in the game seems realistic to the tough due to the Ultra High Definition textures built into this game. 4K Monitor Support is available with this slot. Behind the reels is the desert of Arizona, only one rock tower can be seen in the distance. The reels are built into the train station itself within the background. This means that the train tracks, steps, the building itself and its surrounding deck are all a part of the reels. 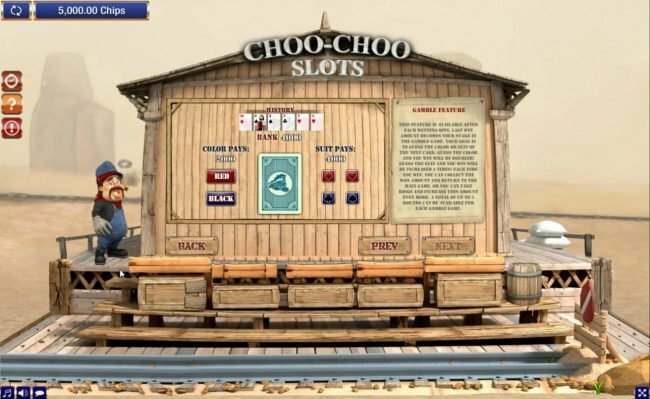 When looking to the reels a trains bell, train whistles, lamps, clocks, crossroad signs, tickets, bandits, pay stations, dynamite, gears and the train itself will all be slot symbols. This game is one of the most immersive on the market. 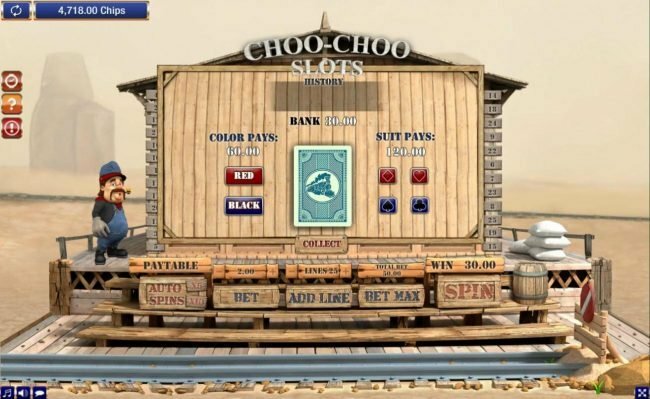 This slot isn’t hard to play as all that is required is to choose how many paylines are going to be in use for the first spin and then choose what the price of the stake bet will be on each of those paylines. Stake bets start at a value of $0.01 and end at a value of $2.00. Choosing to use all 25 paylines with the $2.00 stake bet will cause for the maximum wager of $50.00 to be at play. The wild substitute is created as the gears symbol. 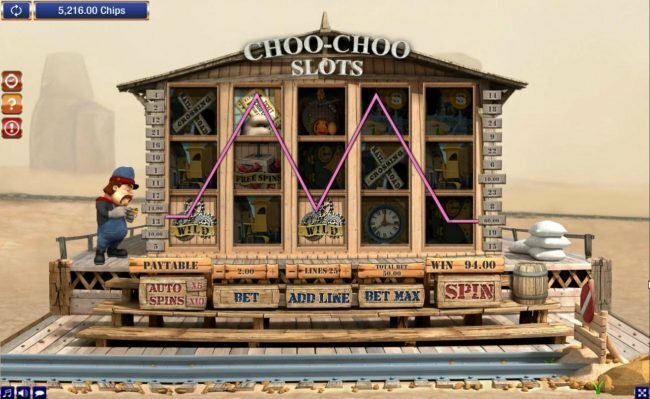 It will substitute each of the normal symbols in this game so that numerous prizes can be triggered simultaneously. It holds no other purpose but has good value as a symbol. 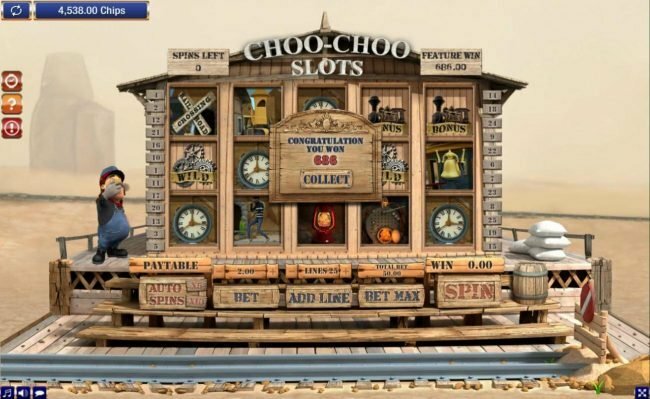 Free spins are awarded through the dynamite symbol. 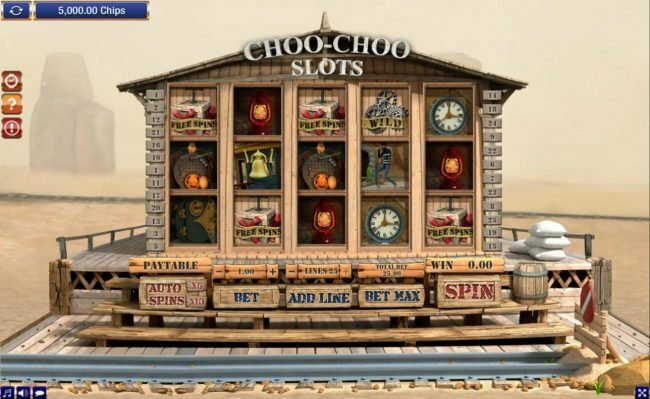 Players who have three of these icons become present on the reels at the same time will be awarded five free spins. 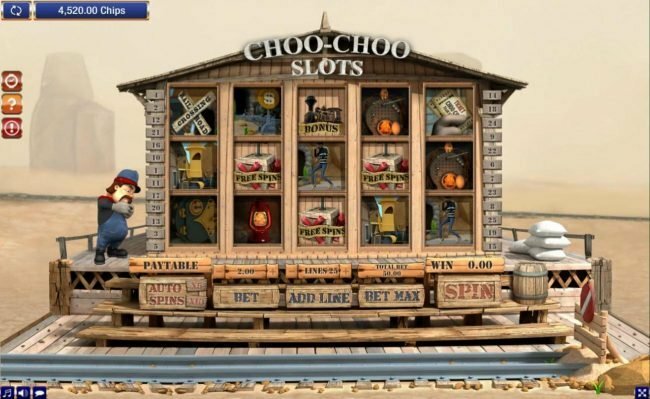 Four dynamite icons trigger ten free spins and five dynamite icons trigger fifteen Free Spins. These free games may also be retriggered in the same manner. The Bonus game which is awarded when three of the train icons are seen at the same time has players travel through Arizona, delivering products along the way. Each product shipped and each destination reached will result in a cash prize. 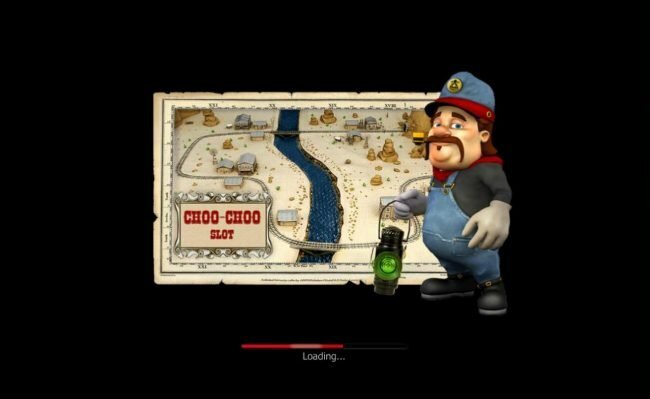 If the train doesn’t reach the next stop then the feature ends. 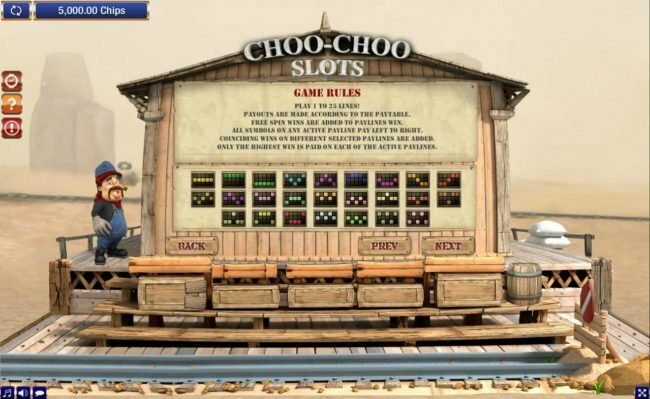 Choo Choo Slot is a game that goes above & beyond the norm of any Casino game in terms of its visuals. There is no other game on the market that provides this level of immersion. Let alone this level of exciting gameplay. It’s for these reasons that this Slot needs to be played today by all.